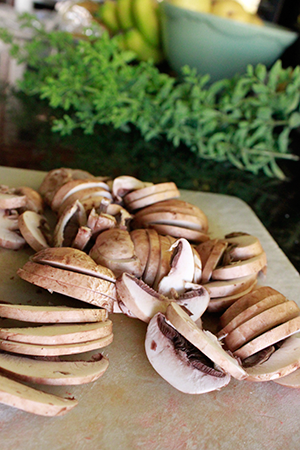 Crimini mushrooms for this beef strog. 1. 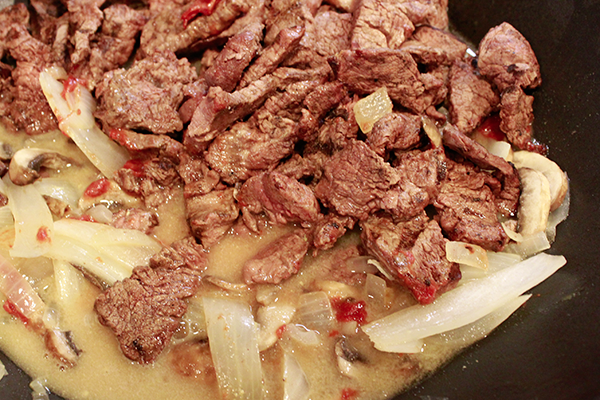 Cut beef into strips and sear in butter in a hot pan in batches. Alternatively, throw the meat on a hot barbeque to get a quick cook and nice sear marks. 2. Cut onions into small wedges and fry in butter or oil until brown. 3. Add water and beef stock cubes, splash of wine if you have it, tomato paste, mustard, chipotle chili. Stir. Cream not added yet - but sauce is yellow from mustard. 4. Add beef strips and mushrooms. 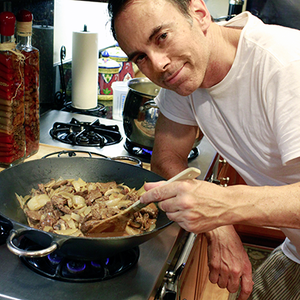 Cook until beef is warmed through and mushrooms are nicely tender. 5. Adjust seasoning: salt, pepper, maybe a little lemon juice if it needs it. 7. Cut some fresh herbs - dill is a very good choice here. Add to dish. 8. Drain the pasta. Serve and masticate. You can use noodles - or linguine.